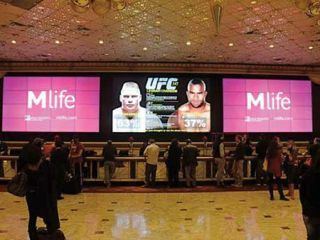 Creative digital signage programs have helped MGM Resorts International communicate with guests in innovative ways. When someone thinks of reducing cost in any business or operation, the first thing that usually comes to mind is reducing capital and/or cutting labor. While these may initially bear some savings, they can lead to unforeseen issues, along with deferring unexpected cost down the road due to not thoroughly taking into account the effects of cost cutting, especially when draconian measures have been enacted. Our group at MGM is a rare breed in that we design, create, implement and maintain the majority of software, hardware, and content for more than 50,000 screen displays. This ability to fully understand the entire process and weigh the pros and cons of the variant disciplines, has given us an immense advantage when scaling back cost becomes a necessary evil. This has always been one that stands out for me. While the technical aspect is fairly easy, it is syncing all the players within your organization that becomes the greatest hurdle. The amount of last minute requests for either new spots, or changes to current spots has always been a challenge. I have found the easiest way to minimize this is through organizational skills and continuous communication. First, if at all possible, funnel as many requests through one central contact person. The marketing group may be the best resource to “herd the cats,” which could include food and beverage, entertainment, retail, hotel ops, along with any outside partnerships. keep far fewer spares on the shelf knowing that it’s the same product line everywhere—only the size changes. This designated point of contact must be proactive and meet with the different verticals within the organization to proactively create a master calendar of events, along with clarifying which venues, specials or events will require content. Another tool for streamlining the content shuffle is to track the events that occur annually or semi-regularly and if your call to action is phrased in a generic manner, it will eliminate several last minute requests. We will create several spots at once for regular entertainers with the tag line “tonight,” “this weekend,” “one night only,” etc. and have them all loaded on the player ready to call up at any time. Another quick win on content has been our Twitter and Instagram screens, which now reside at the majority of our properties. For these, we have created generic ackgrounds, which might be themed property-specific or use a holiday theme such as a Valentine’s Day or Halloween. Venues within the property can post offers or time-sensitive specials through the Twitter handle associated with that particular screen. It’s a quick and easy way to push last minute marketing to your DOOH network. For our group, hardware is a much easier one to tackle because we have little reliance on other departments. As long as we have power and network in the neighborhood, which now may incorporate Wi-Fi, if constraint on bandwidth is not an issue, and we are good to go. One of the first, and quite frankly, best things we did years ago was to establish a corporate standard hardware spreadsheet with a matrix of different options. This grid includes different screen sizes from 32- to 65-inches along with bezel-less options for different video wall configurations. The option for touch and non-touch is very clearly marked out in the grid. We use one screen manufacturer for all marketing content and one manufacturer for broadcast content due to less hours of operations for broadcast screens along with the possibility that some may need to decrypt Pro:Idiom content. Not only does this help with long-term pricing leverage, but enables us to keep far fewer spares on the shelf knowing that it’s the same product line everywhere, only the size changes. This pricing matrix also includes current costs of the player, brackets and cables along with software licenses if applicable. Anyone looking at this spreadsheet can easily grasp the total cost for any signage project in very short time. I’ve also found that over the years everyone has become extremely confortable with this pricing method due to its “easy to absorb” format along with the ability to show the continual drop in pricing for most screens. In fact we will sometime send out a older pricing list, then follow up with and updated list so they can see the drop in price. Our vendors also know that I am open to purchasing end-of-life product and have justified many unbudgeted custom installations by leveraging these discounted products throughout the years. We keep an ongoing list of projects that might not have received funding or have been put off for other projects and if we see major value in procuring quickly, we’ll pull out the pricing matrix I referred to earlier and show the finance group the savings. More often than not the project is approved. Reducing software costs tend to be more of a challenge unless you are spinning up a new infrastructure from scratch or vetting an entirely new ecosystem. I believe our biggest advantage in this space has come with our ability to develop our own software. We have been writing our own code for several years now and have always been able to use this as leverage when working out pricing with digital signage software companies. Another tactic that I use is to request tiered pricing for different types of products. My argument has always been I shouldn’t pay the same for a meeting room door screen as I do for a progressive slot machine, which has compliance regulations along with greater visibility. Have the vendor clearly define where the price breaks occur with additional inventory and put pressure on them to push these limits down or adjust the annual maintenance fees. General rule: If you’re dealing with a large installation base such as MGM Resorts, the enterprise deal always has room for negotiation. Finally, another option, which may or may not be available to you, is the ability to drive revenue streams through external advertising. I’m a big proponent of selling a portion of our screen time, perhaps to a beverage or retail brand. If Heineken is willing to pay for screen time and I, in turn, sell more Heineken in a lounge, it’s a win-win proposition. By generating new revenue, which enables me to expand our ecosystem, which then should drive even more revenue, this is a problem I think we’d all like to have. STEP BACK. WHAT DO YOU SEE? These are just a few of the programs we have utilized over my 21 years at MGM Resorts International. Again, the key is to be flexible, creative and, most importantly, understand the specific goal. I always try and step back and look at the entire program with a fresh approach; it’s the thirty thousand foot rule. Don’t focus on the minutia until you see the entire picture from all aspects and more importantly from all operational viewpoints. Randy Dearborn is vice president of Multimedia & Guest Technology for MGM Resorts International in Las Vegas, Nevada. Randy is currently Chairperson for CCSD/CSN/UNLV Joint Technical Skills Committee, as well as Program Advisory Board for The Art Institute of Las Vegas, is 2014 Secretary/Treasurer of the Digital Signage Federation, and serves on the Digital Signage Expo Advisory Board.